Apply pre-emergent late February to late March to prevent crabgrass. Act now to stop dreaded crabgrass from invading your lawn this spring and summer. Late February to late March—around the time Bradford pear trees start to bloom, but before the dogwoods—is the ideal time to apply a pre-emergent herbicide. It’s important to spread the pre-emergent and to create an herbicide barrier for the roots and shoots of those crabgrass seeds before they germinate. If germination has occurred, applying a pre-emergent is not effective as a weed killer. Crabgrasses are summer annual weeds that germinate as temperatures warm up in the spring, grow through the summer, then set seed and die in the fall. Once established, crabgrasses can quickly spread and devastate your lawn. An application of a pre-emergent herbicide will last about 6 to 12 weeks, depending on the chemical used. Oryzalin and trifluralin are common pre-emergent ingredients. 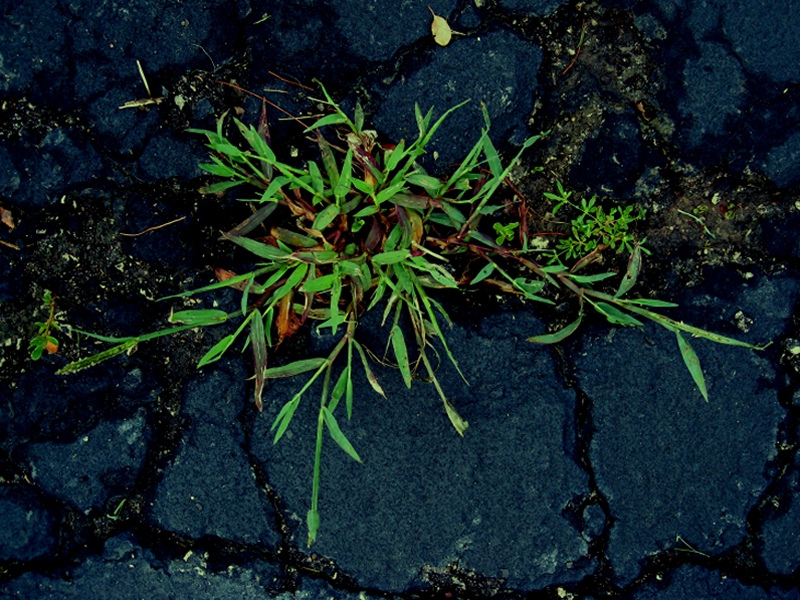 In addition to crabgrass, these herbicides will also control other summer annual weeds such as cocklebur, goose grass, and purslane. You can use most pre-emergents available to homeowners around ornamental plantings and in vegetable gardens, but always read the label! The label instructions will also tell you if you can use the pre-emergent on newly seeded or sod lawns, and how long to wait before mowing. You didn’t get your pre-emergent down in time and crabgrass is invading your lawn? Consider using a post-emergent, selective herbicide such as 2,4-D (Weed-B-Gon, All-In-One, and other brands). Spray directly on the crabgrass weed, just to the point of runoff, rather than broadcasting. A rain-free day when your lawn has not been recently mowed is best. Again, be sure to read the label. For ongoing crabgrass management, I like to simply hand-pull. A weekly walk over my lawn with my handy weed-digger tool, and an eagle-eye to spot emerging leaves, keeps crabgrass and other lawn weeds in check—and I appreciate the exercise bonus! 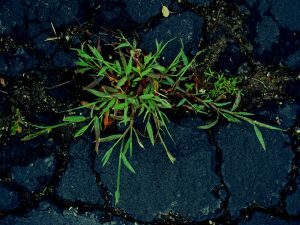 Chemicals and manual labor aside, a thick, healthy lawn, that denies weed seed from coming in contact with the soil and getting adequate light for germination, is the best defense against crabgrass.